California Dreaming! 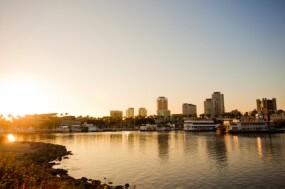 An executive for Harbor Breeze Cruises in Long Beach, California, explains how their hiring process works and much more. In this exclusive interview find out how to create a winning resume and get through the job interview process. Become a CruiseJobFinder Member to access the entire interview. Please describe what your company does. What is your role in the staffing process? We operate whale watching and sightseeing harbor tours around Rainbow Harbor in Long Beach as well as boat charters. I hire all staff. Describe a typical 'cruise' if there is such a thing. What would the shipboard experience be like for a typical employee? Our main bread and butter cruises are the 2-3 hour whale watch cruises and the 45 minute sightseeing tours. On both, the boat needs to be cleaned prior to passengers boarding, the tickets taken as passengers' board, and then making sure the clients have the best possible excursion and all safety needs are met. The employees are also required to ensure that all disembark safely at the end of the cruise. Captain, deckhand, dock master, galley attendant, and ticket booth staff. Do you have a 'season' or 'seasons' where you're busiest? Describe the seasonality aspect of your business. Summer is the busiest time for use as this is when most people want to enjoy cruises. They must look professional, arrive promptly for their interview, have all the required skills and education, and have a flexible schedule. What advice can you offer about resumes? What are the qualities of a great resume? I would recommend people are grammatically correct on both their resume and cover letter. We won't call anyone in with grammar mistakes and people that write in all capital letters, even for positions where they will never need to write a single thing to a customer. It just shows attention to detail and a good level of education to produce a correct resume. Dependability and trustworthiness are the main traits I think people need to work in the cruise industry. What are the typical terms of employment offered? Both full-time employment and part-time casual work is typically available. The pay rate varies between staff but typically a daily rate is negotiated and offered. A lot of seasonal employers have trouble keeping staff for the whole 'season. ' Do you encounter this, and do you give incentives to keep staff for the whole season? We do pair down around November so staff don't always get as much work as they would like but we run year-round so the workload is more steady than a lot of our competitors. What are some common misperceptions people have about working on cruise ships? That they will be enjoying the cruise like the guests. While employees obviously get to enjoy the sights and scenery of the cruise, they are working and must be focused and have their "game face" on, so to speak. Crew must also remember that they will be working the same cruise and see the same sights over and over and over. Access every exclusive interview and start your cruise ship job search today!